Overview: The Detroit Superior Bridge provides the ideal test ground for an integrated approach to community oriented activity and planning. Currently, numerous popular community programs are isolated forcing residents to make separate trips to each destination and inhibiting neighborhood socialization. 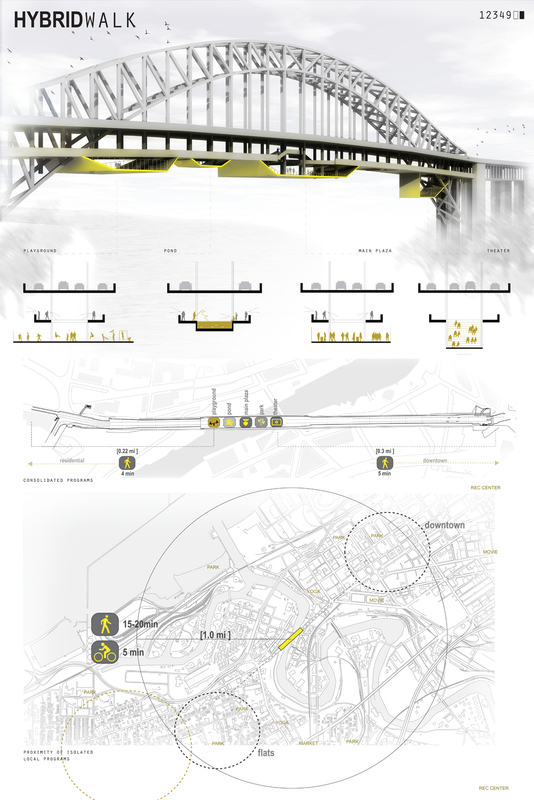 HYBRIDwalk combines these programs into one centrally located public space. This approach provides both a reason for people to visit HYBRIDwalk and creates a gathering space for the community. 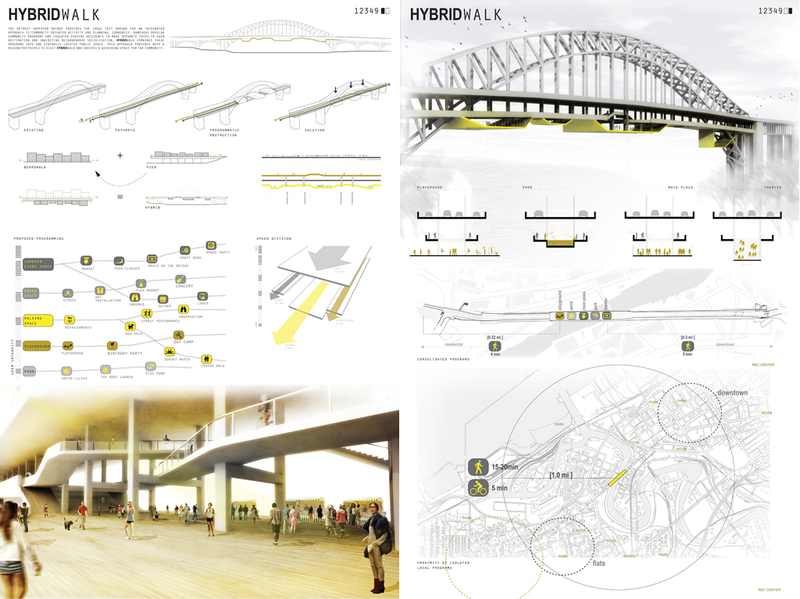 HYBRIDwalk incorporates the boardwalk and pier typologies in the creation of a dynamic, new social space. By combining multiple programs such as children’s play space, amphitheater and multi-function plaza, HYBRIDwalk creates a fluid landscape of socialization within the confines of the bridge. The main plaza hosts small farmers markets, group fitness gatherings and community events, while the amphitheater accommodates movie screenings, concerts, and lectures. The vertical and horizontal manipulation of the bridge deck creates multiple speeds for experiencing the space. 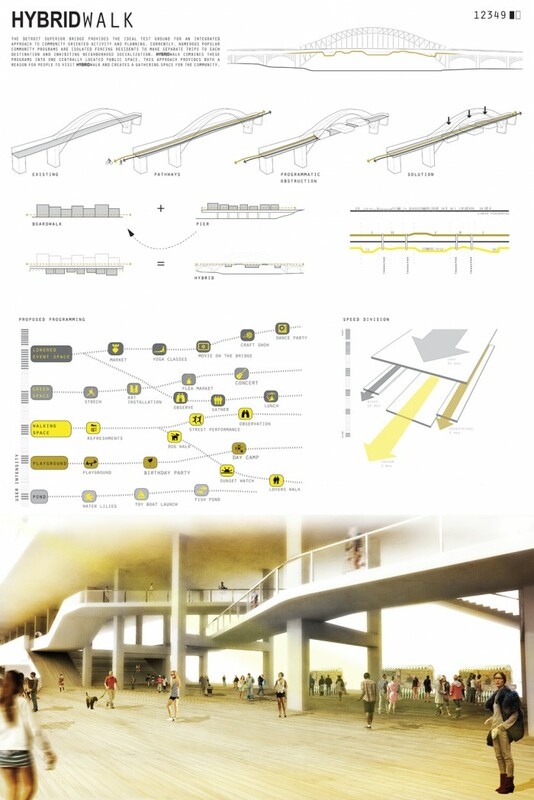 The embedded program spaces function as low speed, high interaction community areas while the unmodified lower bridge deck accommodates cycling and walking paths allowing for rapid transit through the space. The result is a combined public activity and transit zone which engages the community and creates a new public space typology.